First off, holy cheese, Batman. So many great folks stopped by after last week’s #WIPpet #ROW80 post! I couldn’t believe the welcome I got from both groups. Am feeling pretty special as a result. Thanks, guys. Was thinking about it hard, and third person might work better than first. Is 26K in too late to change my mind? Either way, I’m stymied until I decide. Hubs and I launched a whole-house project last week. A room by room deep clean and declutter. I work 7-5, get home at 5:30. Time=scarce. Back=aching. Man, lists really help feel like I’m getting a handle on things. I should show you my room by room house cleaning list. It’s like 14 pages long. Am changing perspective to 3rd. Gulp. Will edit 10 pages per day till done, then back to 1,000 new per day. Daily social media efforts: FB, Twitter, Pinterest, blog visits/comments. Did I mention that “failure” doesn’t bother me? Achieving goals is fun and stuff, but for me, the real enjoyment comes from dreaming big and actually knowing I could do it all. If the planets lined up right. I’m cool with falling short sometimes–knowing I could if it weren’t for this damned stupid gallbladder or the fact that I was scrubbing dried toothpaste out of bathroom crevices last night instead of writing is enough for me. Lack of trying anything at all is where the real failure’s at. Lastly, but not leastly, a #WIPpet snippet. Today is the 30th, and I’m going to do some fancy math, like some of the other WIPpeteers I’ve seen. 30×4-36+(-43)=41. Here’s a random piece from page 41. The sight of what had to be Brynna’s “house” stopped me in my tracks and I stared, forgetting for a moment about being crippled permanently from a hike that distance. The only teepees I’d ever seen before were in books, and had things like antelope and buffalo pictographs painted on them. This one rose out of the field like a gigantic trellis, painted beautifully with a riot of flowers in every color of the rainbow and then some. Roses and morning glories and fuchsia and lavender and sunflowers and dozens of others that I couldn’t even name. There was a small fenced in pasture behind it with two more goats—the tall kind with soft-looking, lop ears—and gardens surrounding the teepee on the other three sides. Out of a flap at the top where the support poles bristled together, a thin stream of woodsmoke rose, the smell reminding me of the bonfires my grandma held here during my childhood to celebrate things like the changing of the seasons and birthdays of friends. Beyond the tepee, rose the mountains in the distance, their tops clearly outlined against the brilliant, rain-washed blue of the sky. It was idyllic. I turned to look at her in disbelief. I hadn’t realized it before, but her wild, rainbowed bandanna sported rows of small, dancing bears and had multi-colored sequins on it that flashed in the late morning sunlight. Sunny had a weird concept of gaudy. How ’bout you? Do you heart lists? How’d you do on your goals for the week? Want to play, too, or see what everyone else has been up to this week? 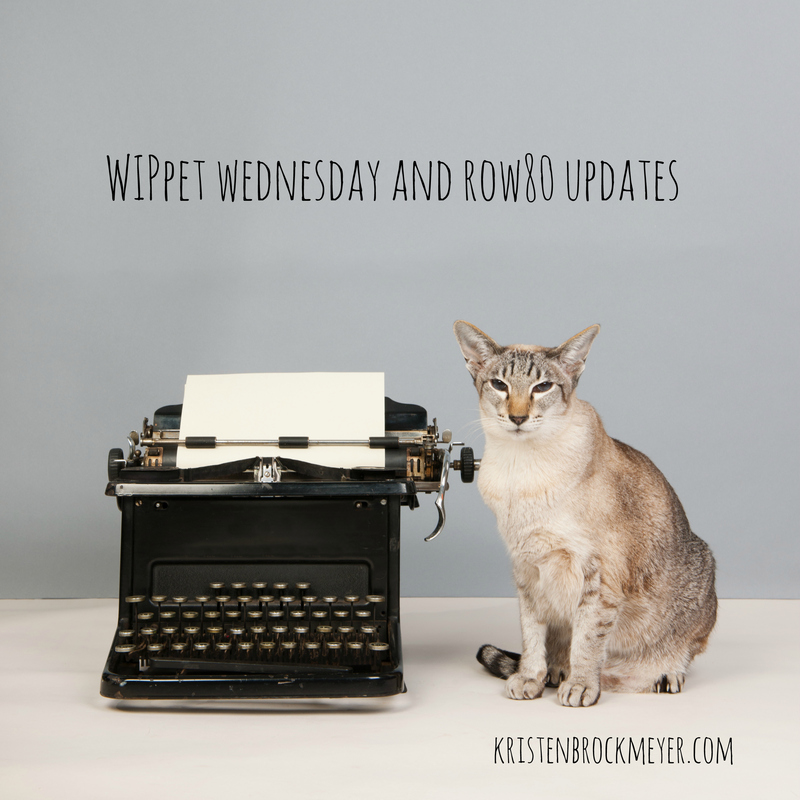 Click the #ROW80 or #WIPpet links to connect. It looks like you’re rocking on your goals. I make many lists, but then I beat myself up when i don’t get to cross anything off. Wow, congrats on all the words — despite all the other projects! That’s impressive. Just my 2 cents, but I prefer third person to first person (and I actively dislike second person). I know it’s popular to write in first, and some people like it for the more “personal” tone. But I feel like constantly hearing a character’s inner dialog and assessment of things distracts from the story to an extent, and it’s really hard to write first person without doing too much of that. Sunny is a character and a half. I haven’t decided if she’s a good witch or a bad witch yet. And agree with you on the first person. My first book is in first person and wouldn’t have worked any other way, but as a reader, I prefer third. Sunny reminds me of every person named Joy I’ve ever met. =/ Brynna, on the other hand – think she’d invite me over? I will not find her home gaudy, but lovely, and I’m very nice to goats. When I decide on a POV shift midstream, I don’t go back and edit until I complete the draft. It’s easier for me that way. We need to do that room by room deep clean here – but I think I’m the only one who thinks so, and I’m swimming upstream. Best of luck to you! Some writers begin with first person to ensure immediacy in their story and then revise to third person. I tend to write in third person and really liked the excerpt for both its lyrical description and fascinating glimpse of the personalities. Gaudy? But the description of nature is lavish, not gaudy at all. Neat sense of humor there. I really also like the cat in your blog banner and think your progress (gall bladder notwithstanding) is pheonomenal! Your busy. Glad you can find the time to write. My house list is much longer than my Row80 list, and quickly taking over my writing time. Show pix. Great excerpt! Yes yes I love lists, love them a lot. I need to go create some new ones! I love teepees. They’re one of my favorite things about home that I miss. Just had them around. I’m from Montana. Sunny does indeed have a strange concept of gaudy! I want to know more about this teepee and its owner!!! I’m so glad you joined us. 🙂 I look forward to reading more of your stuff. I heart lists so very much. And I like your outlook on “failure”. You are rocking the goals, though! You paint a gorgeous picture in the WIPpet! Definitely on your narrator’s side, rather than Sunny’s.